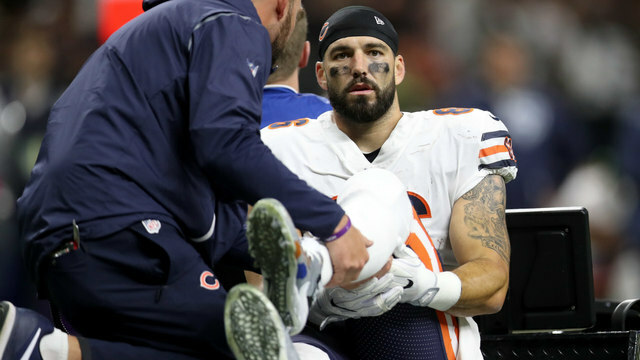 Chicago Bears tight end Zach Miller is retiring from the NFL, more than a year and a half after suffering a major leg injury in Week 8 of the 2017 regular season. Miller announced the news on social media Tuesday and thanked Chicago fans and the Bears organization. “To the city of Chicago, my beloved Bears fans and NFL fans everywhere… The time has come to move on from playing the game of football,” Miller wrote on Instagram. “It has been an incredible journey for myself and my entire family and we can’t thank you enough for your continued support. Miller was rushed to University Medical Center New Orleans on Oct. 29, 2017, after he dislocated his left knee attempting to make a catch against the New Orleans Saints. The tight end’s leg bent at an extreme angle, and he remained on the turf for several minutes until he was carted off. Doctors performed emergency vascular surgery the same night to repair a damaged artery in his leg that resulted from the knee dislocation. At one point, Miller’s leg nearly had to be amputated. Miller entered the league as a sixth-round pick of the Jacksonville Jaguars in the 2009 NFL Draft. He landed in Chicago near the end of the 2013 campaign after the Tampa Bay Buccaneers and the Jaguars cut him. He spent the 2014 season on injured reserve before emerging as a key member of the Bears’ offense in 2015. Miller recorded 146 receptions for 1,631 yards and 15 touchdowns in his 10-year NFL career. The 34-year-old tight end had 101 catches for 1,161 yards and 11 scores between 2015-17 with the Bears. The 34-year-old tight end had 101 catches for 1,161 yards and 11 scores between 2015-17 with the Bears.